That's what I thought a few days ago as I arrived home. It only took me a couple of minutes to place it. That was, the fact that while I had been gone, someone had drilled a pipe into the sidewall of the house. Only, how could that be? I had only been gone for an hour. Had it been there all along, all these years, and I hadn't noticed? Well, after some detective work, I found a small piece of pipe cut-off left on the floor. It was the same colour and dimensions as the one on the wall. Yep, I wasn't imagining things. So, what's all this for? As I followed the pipe on the wall I noticed a box...with the words NBN carved on it. I finally have NBN...well, kind of. I still need to wait for a technician to make the connection from the box to the home. So, not just yet. ...and also, because 5G could be just around the corner. And there is a lot of hype about 5G. Technology is changing fast and 5G is promising really fast speeds. It is the next generation of wireless connectivity that will allow for quicker download speeds. You will probably be hearing a lot about 5G this year. You see, 2G allowed us to send texts. 3G allowed us to share photos. More recently, 4G gave us quicker connections and the ability to stream video. 5G will mean even faster download speeds. The truth is that we are demanding more and more data. You see, while voice usage hasn't really increased that much, we are using our mobile phones for much more than just calls. We use them for everything. Banking, news, sharing photos, video streaming, you get the gist. And as we do this, we are guzzling insane amounts of data. 4G networks are already getting congested with so much data use. But, 5G is not just about bringing in faster speeds to users, there is another reason why 5G is important. It will allow for more human connections, but also for smart devices to connect with each other, without the need for humans. It will allow for technologies like self-driving cars, augmented reality and even remote robotics to happen. While companies like Google and Tesla already have self-driving cars on our roads, 4G isn't quick enough to give cars human-like reflexes. With 5G, the latency (or time delay) drops, which allows for faster response times. And, as you can see in the graph below, 5G adoption could happen quite quickly. 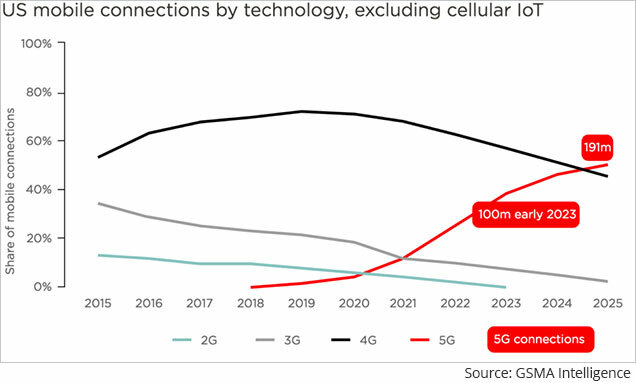 In the US, we could see 100 million 5G connections by 2023 and 191 million by 2025, according to GSMA Intelligence. How is 5G so much faster? Well, that's a key concept to grasp from 5G. To cope with the massive amounts of data we require, the world is embarking on a communication infrastructure buildout. While 4G uses huge antenna towers that cover a large area, 5G is very different. 5G uses small cell phone towers instead. These cell phone towers will be placed closer together serving smaller areas. The fact that you are closer and that there will be more towers scattered around will allow for faster speeds. Carriers are investing a lot of money into this infrastructure build out. 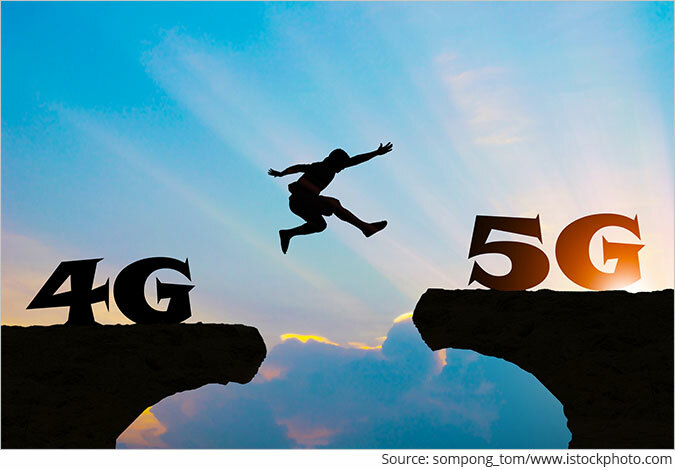 According to IDC, courtesy of ZDnet, spending on 5G network infrastructure will go from US$528 million in 2018 to US$26 billion by 2022. This buildout will happen in phases, and will require the construction of a lot more towers than the amount of physical infrastructure 4G required. 5G infrastructure buildout could transform the way we communicate. And 5G could be arriving very soon, as early as this year, and so could the first 5G phones. PS: Now you can follow Vivek Kaul on Social Media and get Vivek's updates on the critical issues affecting the economy and your wallet... as they happen. Follow Vivek on Facebook, Twitter, and Google+. Please note: This article was first published in Markets & Money on 26th March 2019. Selva Freigedo is an analyst with a background in financial economics. Born and raised in Argentina, she has also lived in Brazil, the US and Spain. She has seen economic troubles firsthand, from economic booms to collapses and the ravaging effects of hyperinflation, high unemployment, deposit freezes and debt default. She is lead Editor at the daily e-letter Markets & Money. Vivek dwells into a new YouTube phenomenon. The country's largest car maker has cut production by more than a fourth. The minutes of the meeting of the RBI Board which happened before demonetisation have been released. For the first time in four years, car sales, two-wheeler sales, tractor sales and commercial vehicles sales, all fell in February 2019. Equitymaster requests your view! Post a comment on "A New Infrastructure Boom". Click here! 1 Responses to "A New Infrastructure Boom"